A short paved path leads to the house patios and the doors. 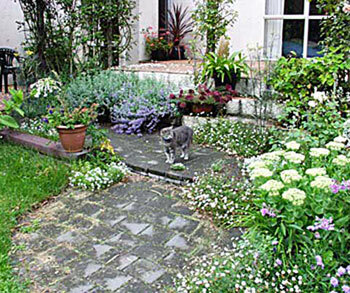 When I first arrived at Mooseys I was in my Cottage Garden phase, and immediately planted catmint to sprawl over the patio path edges. Naturally the Moosey cats spend a lot of time here, rolling in this aromatic plant and squashing themselves into cat-nests. But well-bred cats and dogs always use the path provided, and many of my animal photographs are taken here. 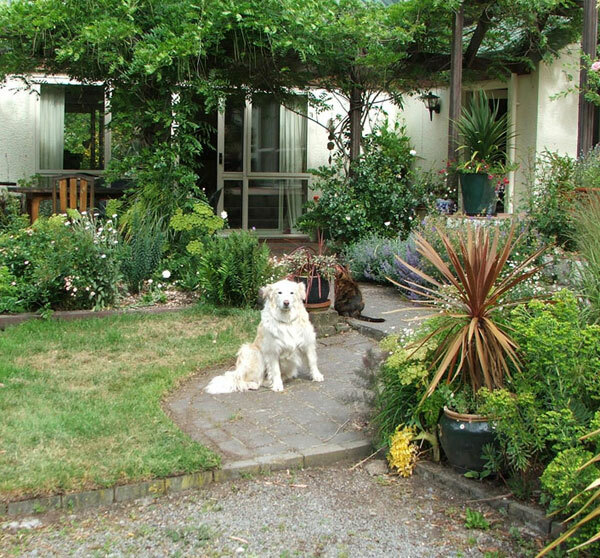 Cats will sit on the path waiting for the Head Gardener to enter the house and open the fridge. Dogs, too, find it a good vantage point. They can check anything arriving on the driveway as well as keeping an ear out for exciting kitchen (food) noises. And of course there's sun - this is the hottest path in mid-summer for stretching out or sunning ones cat-tummy. The tiny curved patio path is just built from cheap square 'cobblestones', which have been laid in sand. Weeding is annoying, and best done with one of the sharp kitchen steak knives. Oops. I encourage the Mexican daisy, Erigeron, to self seedin the cracks. It always seems to be in flower, and softens the grey stones, and stops weeds from growing. Though, alas, Erigeron itself is considered a weed.